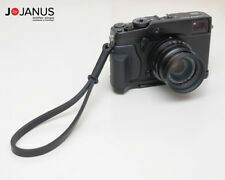 This strap is suitable for all brands micro digital cameras that with rings connection, such as Leica, Fujifilm, Sony, Nikon, etc. Each strap comes with a metal ring and a protective leather pad, which allows you to use different interfaces on the camera. Features: - High quality leather material with excellent workmanship, soft and elegant. - Supplied with a pair of rings to enable connection with ring connection cameras. - Best choice for your camera accessories, makes carrying your camera very comfortable. 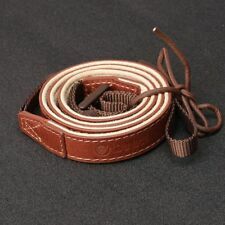 Specifications: Color: Brown Material: The first layer of leather Length:105cm Width:12mm Thickness:2.6mm . Add a high quality belt connected with the leaher strap which allows you to adjust the length by your preference. Can wear over the shoulder or around the neck. Looking very retro and literary. 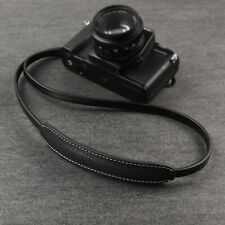 Strap:(110-135mm) Length x 13mm Width. Made of premium quality British bridle leather with lightly burnished edges. This strap is sewn by hand with heavy duty polyester thread and wrapped with 1mm waxed thread. Split ring type strap / lug mount. Half Strap Length (Hang on the neck): 450mm. Simmilar Strap - CANPIS. - Provided with a triangular fin which makes it easier to install and remove the connecting ring without damaging nails. 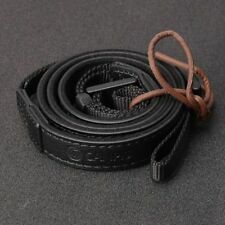 - Half Stra p Length (Hang on the neck ) : 5 00 m m. - Material: Top layer of cow leather. 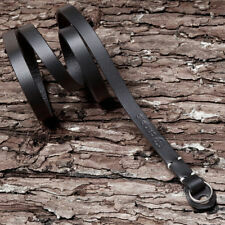 The JJC HS-N black hand strap is made of Genuine leather and ergonomically designed for comfort. Compare with the Nikon AH-4 hand strap. Nikon : D3100,D7000,D5100,D3, D3x, D700, D300S, D300, D100, D200, D1, D2x. D90, D80, D70s,D70,D60, D50,D40X, D40, D500. Handmade in Portugal|Jby Janus. Made of premium quality British bridle leather with lightly burnished edges. This strap is sewn by hand with heavy duty polyester thread and wrapped with 1mm waxed thread. Here are the highlights of this products Buy With Confident. All JJC and Kiwifotos Products Are Back By 1 Year Manufacture Warranty. ◈ Battery Storage Cases. ♢ RG316 Coaxial Cable. ◈ Panasonic. For Common Models DSLR/SLR and Rangefinder: Leica Canon Nikon Minlota Olympus Ricoh Rollei. etc. Since every piece is handmade and unique. suitable for most common strap width size - maximum at 10mm ~ 11mm. ✔ Made from high 100% quality genuine upper grain leather = that is the highest leather quality. ✔ Perfect gift for photographer. ✔ Strap width: 3.5 cm. let you stay in focus only on taking photos instead of feeling of tiredness and neck or shoulder pain. Material: Top layer of Italy cow leather. The strap is ready to use,ALL YOU NEED IS ATTACH AND SHOOT. let you stay in focus only on taking photos instead of feeling of tiredness and neck or shoulder pain. 100 % Buffalo leather. Exactly as described! Strap width is 1.5" wide. JJC NS-OA1 is suitable for most common strap ≤ 12mm in width. JJC NS-OA1 includes a pair of circle ring and a pair of protective leather. Easy to mount and secure to use, JJC NS-OA1 is an ideal choice for you. ✅ Adjustable shoulder neck strap design for different needs. Material: Cotton PU leather. ✅ Made of high quality cottom and PU leather, comfortable and durable. ✅ Install quickly and easily. Color: Black. D7200, D7100, D7000. using D750 with MB-D16 together. using D810 with MB-D12 together, using D810A with MB-D12 together. using F6 with MB-40 together. using D610 with MB-D14 together. ◈ Brake And Clutch System. JJC SRB-BK BLACK Deluxe Soft Release Button for Fujifilm Leica Canon Nikon Sony. ◈ Flash Diffuse. - OLYMPUS E system. etc. ◈ Sailor Moon. ♢ Filter Combination. ◈ Flash / Speedlight. Compare with the Nikon AH-4 hand strap. Nikon Binoculars and. Colour: brown. Strap: approx. Length (max): approx. Materials: soft fabric, fiber blends, cow leather. A perfect gift for the shutterbug in your life! Make photography more comfortable with this hand grip strap. Due to the different display and different light, the picture may not reflect the actual color of the item. Camera DSLR Grip Wrist Hand Strap Universal For Canon Nikon Sony Accessories V! ✅ Adjustable shoulder neck strap design for different needs. Material: Cotton PU leather. ✅ Made of high quality cottom and PU leather, comfortable and durable. Color: Brown, Black. Material: Cotton, leather. Color: Brown (As Pictures Show). Notes: The real color of the item may be slightly different from the pictures shown on website caused by many factors such as brightness of your monitor and light brightness. ✔ Made from high 100% quality genuine upper grain leather = that is the highest leather quality. ✔ Perfect gift for photographer. 2 Leather ARRI Rosette standard handles. 2 Arri Extension Arm. More stable for 15mm shoulder rig system. The wingnut on the handle and 15mm rod clamp loads spring. You could pull it outside if you don't have a space to rotate.